Thanks for the review @Errol . Does the Paradigm also take Feather Pro Supers? I haven't used a Karve but would assume the plate C be reasonably mild. I'm assuming if the Paradigm takes the Supers this would lift the level of aggression. Have you tried the Supers? I was surprised the reviews on Bullgoose Shaving didn't discuss blades at all (except for one mentioning they use Titans). I do not have any Supers so cannot answer your question. You’re right there is precious little information on blades for the Paradigm anywhere. Perhaps @Bosley might be able to advise. We are proud to announce a very special limited edition of the Ti RS-10 Shaving Razor. This luxury DE razor is machined from premium light weight Titanium. Total razor weight is only 60 grams (versus our RS-10 stainless steel version which weighs 110 grams). This lightweight Titanium razor offers an unbelievable, effortless shave. You will feel like you are holding a refined jewel in your hand. 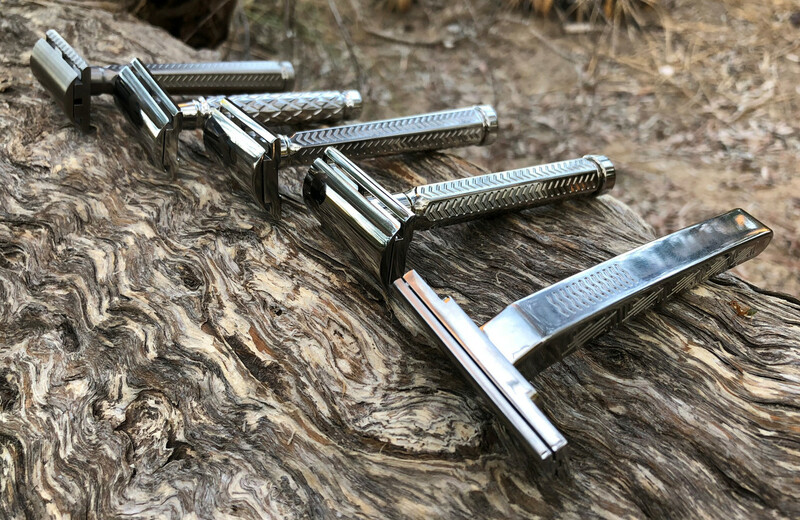 Our previous manufacturing run of the RS-10 Titanium was limited to only ten razors, which sold out in under five minutes. Due to the overwhelming demand, we are offering the exquisite Ti RS-10 for a very limited time. 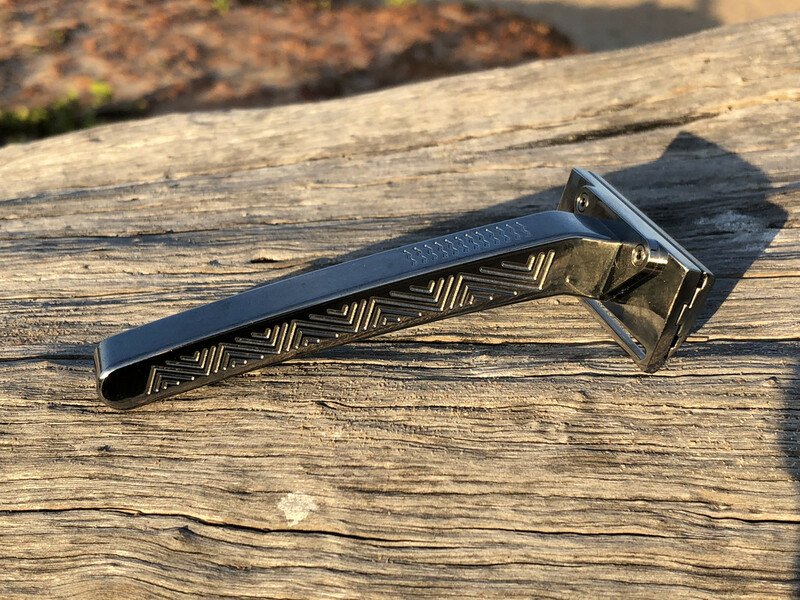 One hundred (100) of these Ti RS-10 DE razors will be created, and they will only be available to those who register through this newsletter. You will also have the option to decide if you want, or don't want the RS logo engraved on the top plate. (We don't have ego problems, we want you to be happy). To register for your Limited Edition Ti RS-10, please sign up using the link below. No deposit is required. Once we reach 50 signups, we will start production and require a 50% deposit to reserve your razor. The final cost of the Ti RS-10 is $550 USD, which includes two base plates (mild aggressive & medium aggressive). Note: We will only produce this Titanium RS-10 version if we receive pre-orders of a minimum 50 people, so share with friends (or you may want to consider purchasing a second one as a special gift for a family member or loved one). Reserve your Ti RS-10 here: Click here to reserve your Ti RS-10 Razor. Or call us at +1 619-822-2525. Copyright © 2018 Raw Shaving LLC., All rights reserved. option to decide if you want, or don't want the RS logo engraved on the top plate. (We don't have ego problems, we want you to be happy). So if you do take the plunge would you have a logo or no logo? Very surprised the bottom plate is not engraved or stamped with the logo, name and batch/serial number for that price. Especially to reduce counterfeiting. I was given the option on the pre release Ti RS-10 if I wanted a Logo and chose a Logo. On the limited release version I've chosen not to have a Logo; the reason being to differentiate between the two. I too would like to see serial numbers especially on such a limited release but serial numbers have not been mentioned. The Vector is Blackland’s first entry into the first Artist Club SE razor market. My initial reaction when seeing photos of the razor was that it reminded me of a champion greyhound with not one bit of extra meat anywhere. In the flesh the Vector is exactly the same with the minimalist approach being evident everywhere. 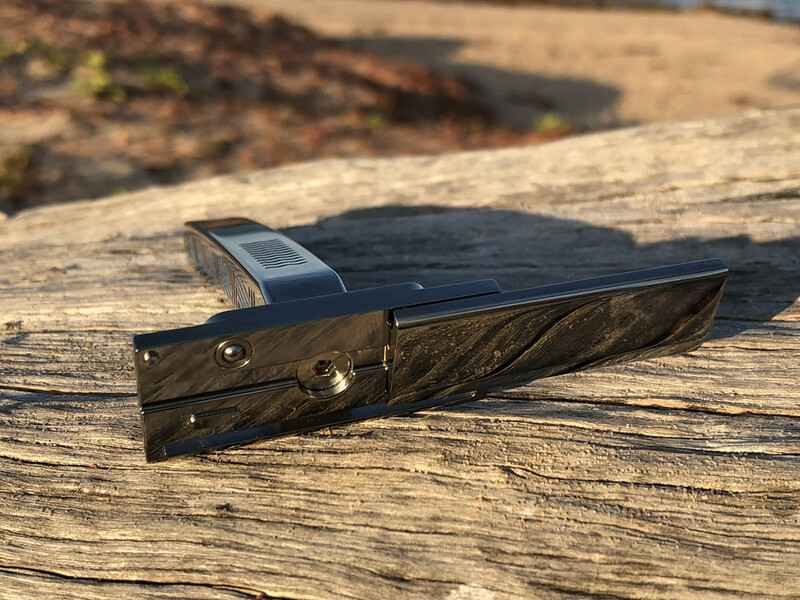 I sure there’s not another fully stainless steel razor out there that can lay claim to having a lower weight than the Vector. Blackland have used their idea previously employed on their GEM Sabre razors of removing material off the side of the top cap post to fit through the center hole of the AC blade and clamp everything together. I never experienced any difficulty in assembling the razor but if it was assembled fractionally out of square and put pressure on the screw I can see potential for cross threading on the cut down post. With the handle being so thin, one could be forgiven for thinking that it would not provide sufficient grip but this was not the case. Even with that long thin neck on the handle the razor felt natural to use and control. I had difficulty seeing the blade when it was placed on the cap while being loaded; the cap and blade are a similar color and size making it just that little bit harder to make out that the blade is fitted correctly. Because the head is so narrow, it does not carry a lot of lather so I found myself rinsing the razor a bit more than normal to clear the lather that built up; just an observation. In use I could not discern much difference in feel and results between the Kai and Feather blades used. Both blades produced a smooth shave akin to that of the Karve CB #C plate and to its credit there is just a hint of blade feel; not a lot, but enough to let you know that there is a blade there and for me this makes the razor a pleasure to use. This is a very nice razor to use and to make the Vector even more appealing there is a polished version on the way early in the new year. @Errol excellent review and observations. I too have thought how does those threads not get damaged especially in a misalignment situation. Now we know, it is possible. Again as others have mentioned it you are the man for latest razor reviews. We are so fortunate to have a local member who is prepared to but the latest and share it all. On this, I think you have convinced me to wait for the polished dart. That would look very nice and shave accordingly. Also I noticed you like blade feel. Same here, the razors I have that lack blade feel give me a false reading so harder to use and gauge their efficiency. Mate, I/we appreciate the time and effort you put into these weekly reviews. Agree with the gents above thanks @Errol for your contributions. I think it's a very good idea. I need to check if there is a space for the 'Ti RS-10' engraved, but definitely serial numbered is a must and should be no problem doing. Absolutely blown away, quick, polite and efficient. I cannot see a 2019 Sabbatical flag waving in the breeze under your name this time next year. It was grand and learnt a lot and bloody annoying at the same time. But the end of the day it was worth it. 1st of January is going to be an interesting day. May have to put the phone away while out and about. I have previously expressed my opinion that the Stainless Steel RAW Shaving RS-10 Clear Cut is one very good razor. Stainless steel, flawless polished finish, quality, presentation, feel, shave ability, accessibility and availability, the RS-10 has the lot. Distribution of the RAW Shaving line up of razors has now been extended to a few specialist sellers but both my RS-10 and RS-18 were purchased directly from RAW Shaving themselves and I believe this has been the main reasons why I was able to secure the Ti RS-10 variant. After being in contact with Avi at RAW Shaving ever since I got wind of a Titanium RS-10 being released, I was eventually allotted one of the 10 pre production units. I was advised that these pre production units were manufactured to see if Avi liked them before deciding if a limited edition run would be done. He must have liked them because a run of 100 limited edition titanium RS-10 razors will go ahead if there is sufficient interest; there must be 50 pre orders for the limited edition run to proceed. My name is down for one. Manufactured from Grade 5 titanium and then polished, this razor has finesse and presentation in bucket loads. Weight is the most notable point for me; at an advertised 60g the razor is just so light in the hand. I even checked to see if the handle had been hollowed out and from what I can see it hasn’t been. Every time I picked the Ti RS-10 up I couldn’t believe the weight; this razor is just so light. 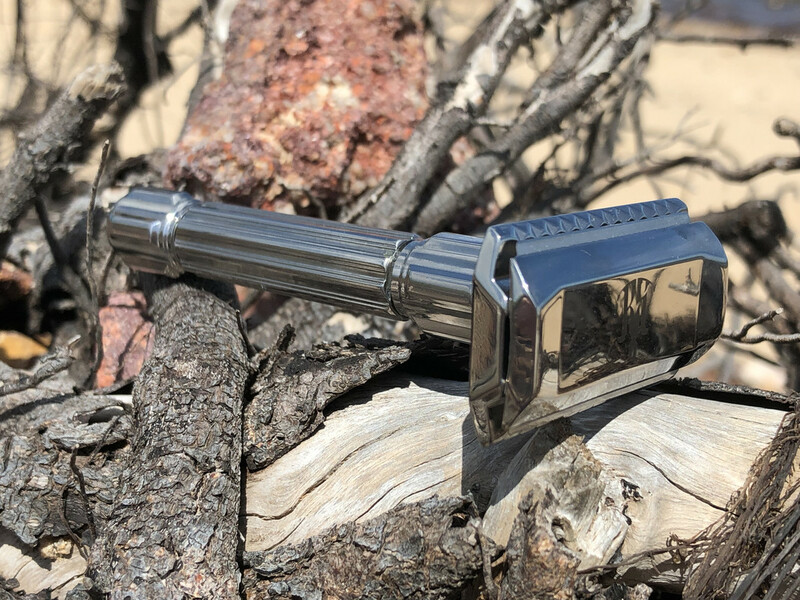 Polished titanium certainly produces a magnificent deep luster and the quality of the polishing on this razor is something to behold. After I’d been advised that I’d been allotted a razor I was asked if I wanted the manufacturer’s logo on the razor to which I responded that I did. Nice touch. I selected a Gillete Nacet and combined it with the mild plate for the first shave. Avi had sent me an email especially to advise that I should use the mild plate first which is something I would have done anyway. I was blown away because the first shave was silky smooth as the razor just glided over the face with Karve CB #B + efficiency. Even for an efficiency level so mild the effectiveness of the Ti was unbelievable. That shave was pure bliss and if I was wise I would just keep using the mild plate but for the second shave I fitted the aggr plate. 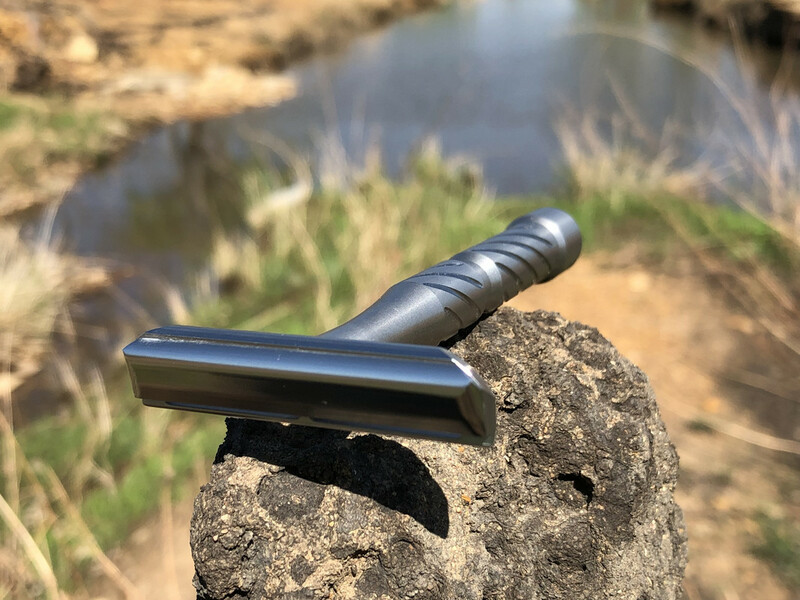 Based on experience with the RS-10 stainless steel razor I was not expecting a large variance in efficiency between plates but the variation between the plates was a lot smaller than I ever expected; Karve CB #C -. At this point I contacted Avi to ask if I may have been supplied with two mild plates. As expected he was really worried that something had gone horribly wrong but a vernier confirmed for me that there was a difference between plates. My third shave with the aggr plate and a Kai blade established that the aggr plate is Karve CB #C – level efficiency but even with such a small gap in efficiency the aggr plate was not as smooth as the mild plate. The fourth shave with the mild plate confirmed the smoothness and effectiveness of this razor. This is a really great razor but it has the potential to be even better. As a pre production razor feedback from users can only help develop the production razor to display its full potential. The mild plate is superb and can be left unaltered but the aggr plate needs to have a wider efficiency gap to the mild plate and at the same time make the aggr plate as smooth to use as the mild plate. The combination of the Ti RS-10 razor and mild plate produced wonderful shaves. Put your name down for one, you’ll be pleased you did. And Avi, if you read this review, I would recommend that each of the limited edition Ti RS-10’s be serial numbered. No #46 for me please. Hey, Errol. Like your reviews mate, keep them up. I'm about to receive my very first modern adjustable plate razor, the Rockwell 6C. Do you know where I can purchase this razor? I like the looks of it and I want to try it, too if it's not too expensive. Thanks for the compliment. I thought you’d bought that Rockwell 6C ages ago, I was going to ask you for a review on it but I’ll have to wait, won’t i. If you’re interested in the Ti RS-10 please see item #84 above. Thanks Niko. You’re still taking to me so the RS-10 you bought must be working for you. Happy New Year to you also. I did buy it but it's taking it's sweet time to get here. Just three more days for me to try it, then I'll write the review for you if you want me to. I hope your Christmas was well, and I hope you enjoy the new year. Yes mate. The S/S RS-10 is a sensational razor.